With the release of its hotly anticipated Final Cut Pro X (FCP X), Apple breaks new ground—not just with its flagship video editor's interface and underlying infrastructure—but with the whole mindset of what it means to be a working professional video editor. Apple has revamped Final Cut Pro's hands-on user experience in three major areas: Editing, media organization, and post-production workflow. New tools such as the Magnetic Timeline, Clip Connections, Compound Clips, and Auditions provide a smooth, intuitive editing experience. With the rise of data-centric workflows and tapeless video recording, organizational tools such as Content Auto-Analysis, Range-based keywords, and Smart Collections work in the background to automate formerly tedious and time-consuming manual processes. Post production workflows now offer customizable effects, integrated audio editing, color grading, and a host of streamlined delivery options. With this new application, video pros can no longer follow traditional ways of working. 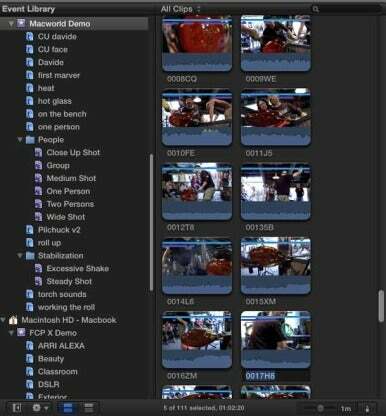 Clips in FCP X's new Event Library are sorted by both user-created Custom Keywords (blue icons) and Smart Collections. The latter are created automatically by Content Auto-Analysis during import (purple icons). Final Cut Pro X, despite its familiar name, is not an upgrade of Final Cut Pro 7. It is a brand new product. FCP X is also no longer part of a suite of applications such as Final Cut Studio, but rather one of a trio of component parts that include Final Cut Pro X ($300), Motion 5 ($50), and Compressor 4 ($50). All are available separately for download from the Mac App Store. There will be no boxed copies. Final Cut Pro X starts off by immediately analyzing your media as it begins to import footage, while at the same time archiving critical secondary information on color balance, motion, rolling shutter artifacts, tracking, and stabilization data on a clip-by-clip basis. While handling the bulk of analytical information at ingest, FCP X is tagging the files with metadata in a manner that speeds secondary file processing, delivery, and rendering capabilities and vastly accelerates workflow. The heavy lifting of this content is invisibly handled in the background—between the application and the Mac operating system—as a byproduct of the conversion to a fully 64-bit application workflow. The most profound interface changes to FCP X—beyond the new darker look—are the Event Browser and the Event Library. Importing your content into the app creates a new Event, a virtual folder that holds all of the information about your media: what it is, where it's stored, and whether it’s from a specific date, place, or client. You can even rate, organize, and show or hide clips from view while accessing tools like Keyword and Smart Collections. Events are created by the application as part of the ingest, in addition to your organizational effort. When you're done creating your video, you can use the direct upload options within FCP X to share it on Facebook, Vimeo, YouTube, and CNN iReport. 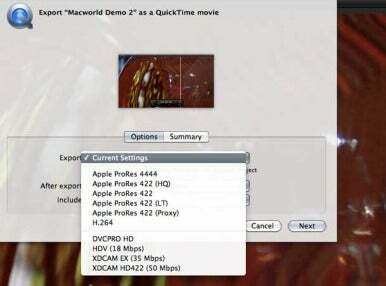 All Apple devices are available as options, as well as Podcast Producer, output for standard definition DVDs, and even Blu-ray devices, directly within FCP X. Plus, the application still offers fully integrated processing with Compressor. Standalone export output options offer all flavors of Apple's ProRes, H.264, DVCProHD, Apple HDV, and even Sony’s XDCamEX format at 35Mbps and the 50Mbps version of the XDCamHD 422 codec. Here are the currently available output options for file delivery when exporting your project directly from FCP X. In this hands-on First Look at the new Final Cut Pro X , I'll walk you through some of the major interface elements that inaugurate new ways of editing and organizing your video. Acting as a trackless canvas for your video edit, the Magnetic Timeline allows you the freedom to arrange and re-arrange your media wherever you want. Existing clips on the timeline slide in and out of the way without danger of collision or overwriting a previous edit. They snap into place “magnetically,” dynamically aligning with existing media in the timeline. Despite being trackless, you can easily create multi-level compositions and properly maintain continuity as you move media around in your project. This feature interactively shows you exactly what’s happening in the timeline as you work, so you can easily execute your vision. Designed to maintain the continuity of media in the timeline, Clip Connections are relational links between primary media in the timeline and secondary elements. Content such as titles, B-roll, sound effects, and even music, can be moved and repositioned seamlessly as a single clip, maintaining audio and video sync, and giving you a clear, visually defined connection to your assets. Alongside Clip Connections and its facility at combining primary and secondary elements into a cohesive unit for editing and filtering, Compound Clips further advances the concept by allowing a complex multi-element group of media to be handled as a single clip. It's easy. Just select the relevant media and choose Create Compound Clip from the File menu (or hit the Option-G key command). Compound Clips let you move, duplicate, and handle clips as an individual segment. You can even share such clips across multiple projects or use a clip to apply filters and effects across all combined elements. The Compound Clips feature helps video editors remove clutter and simplify the timeline’s organization, while maintaining media continuity. This is the Compound Clip when open. The Compound Clip command offers a vastly simpler timeline that minimizes the additional track and clip information until needed. Think of it as a nested sequence on steroids. This is the Compound Clip when closed. Think about being able to create multiple versions of an opening or closing sequence for different clients or presentations. That's the power of Auditions. With this feature, you can view various alternative scenes in your video without leaving the timeline. Auditions provides a fast and easy way to preview a number of variations—with any media collection—in real time. To create Auditions, just drag the shots to the same place in the timeline and choose the Add to Audition command. This allows the Magnetic Timeline to handle the sequence continuity and sync. Auditions lets you dynamically preview multiple clips within the timeline without disturbing any other media. 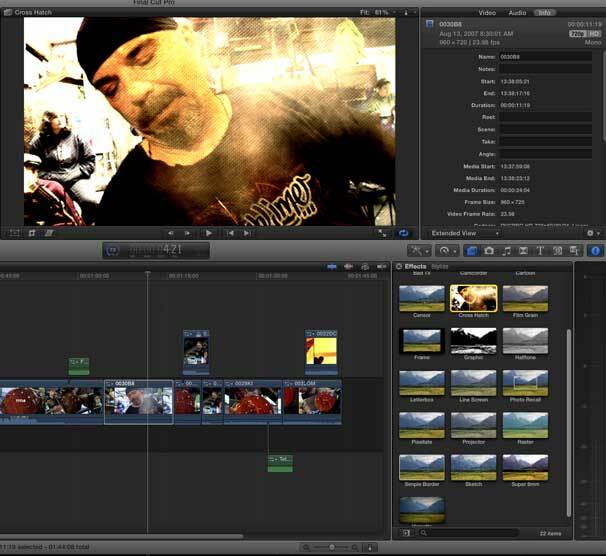 Underneath the surface, FCP X mines metadata from your content from the second you ingest footage from the camera. That data stream includes information such as camera type, frame rate, white balance, and a host of other pre-defined parameters. The Content Auto-Analysis feature can, during import, distinguish individual people, shot types (close, medium, and wide) and rolling shutter artifacts common to many CMOS cameras. It can also rectify stabilization issues with hand-held shots, adjust overall color balance, and analyze and remove excessive audio noise and hum or silent audio tracks from footage. Much of FCP X’s automatic keyword creation is derived from this media detection functionality. The program uses the information gathered to create keywords and automatically assembles assets into Smart Collections within the Event Library. Thus, while importing your content, FCP X is sorting, categorizing, and auto keywording in the background. In addition to the keywords that the program assigns, you can add or edit your own keywords to identify specific shots in any manner you choose. Since you can have multiple keywords for the same clip, and all of those clips would appear in each search and link to a single original piece of media, you can accomplish faster, cleaner edits. Applying customizable effects offers you a real-time preview of the effect on your video in the canvas. Note that the thumbnail view in the Effects Window also shows the clip. The new Skimming feature brings added power to the content preview in FCP X. Another result of this metadata analysis is the ability to create a keyword selection across multiple pieces of media. Range-based Keywords allow you to flag a keyword across all or just small parts of multiple clips. Keywording offers a larger, far more flexible canvas. No longer are you restricted to specific bins or folders. Borrowing a page from its iLife line of consumer apps, FCP X lets you browse all of your attached media and content libraries within the program. View your iTunes, iPhoto, and Aperture content as well as Motion Libraries directly, as well as 1300 royalty-free sound effects offered as a free download, available via Apple’s software update, after you purchase FCP X.
FCP X provides a wide array of content, including animations, titles, transitions, and effects sequences, all accessible and editable within the application. Much of this content was created specifically for Apple by Hollywood effects pros and graphic designers. Customizable from the start, these effects allow you to preview a clip by selecting a shot and then using the skimming function to get a true instantaneous, real-time preview—both as a thumbnail and in the viewer—of how your shot will look with that effect applied. You also have access to all of the transform functions (crop, scale, rotate, and distort) as well as keyframing of those effects without having to jump between different parts of the interface. Effects imported from Motion 5 can be managed to allow you to modify different parts of the program's new Parameter Rigging feature. 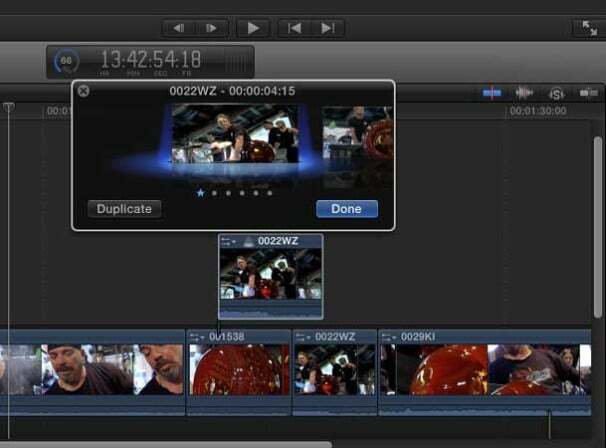 Apple has chosen to fully integrate audio editing into FCP X. Starting with the ingest, the program analyzes content for hum, noise, and dynamic audio changes. It even automates audio sync from an external recorder and the camera, matching audio and video via the waveforms, to connect content and sync it properly. This was formerly a manual process. With a large library of sound effects and high-quality audio effects plug-ins available in FCP X, you now have greater control of your audio enhancements than ever before. You can access control for sub-frame audio edits as well as many of the available 64-bit versions of third-party Audio Units plug-ins. Whether you need a single-click correction or want to create a stylized look, all color work now happens within FCP X. From the first analysis, color balance and correction are mapped for use, allowing you to quickly match multiple shots in the same group or refine the look of any clip in the Event Browser or the timeline. 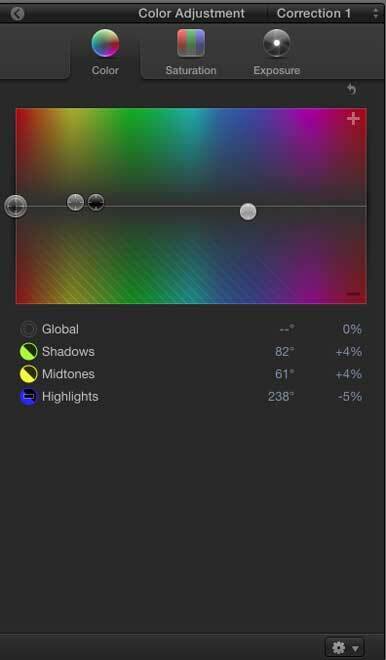 The Color Board gives you a dynamic way to make custom modifications to overall color, saturation, and exposure, while allowing keying and masking to be done simply and directly within the app. The Match Color feature offers a fast and easy way to match the overall color, contrast, and look between two different shots to maintain a project's visual continuity. The Color Board represents the essence of Apple’s FCP X interface changes. It allows you simple control over exposure, color, and saturation. Apple’s new Final Cut Pro X has been re-designed from the ground up with a radically different approach—one that acknowledges and uses device and camera data in a manner that has never before been attempted in the video editing environment. With this release, Apple shows us the future in which data streams from all the devices we work with communicate seamlessly, sharing media behind the scenes. Think of the advantages and possibilities when all the effort you put into setting up a shot or project continue downstream from your camera into post-production, or follow your content when it’s delivered on the web. That's the promise of Final Cut Pro X. Will that promise be fulfilled? My review of Final Cut Pro X is coming soon. Stay tuned.